A project on social enterprises in South Africa yielded two key insights for international business. First, partnering with policymakers can strengthen both the relevance and the rigor of research. Second, both the (relatively few) large, multinational social enterprises that obtain funding and operate across multiple countries (whether global or intra-African), and the myriad single-location, informal micro social enterprises are globally connected. Micro social enterprises are linked to the formal and often multinational sector through their main source of funding: corporate social investment. This suggests that the social implications of cross-border businesses are more complex than previously understood. In an era of globalization, the potential of international business scholars to meaningfully contribute to scholarship is perhaps greater than ever before. But a number of scholars have recently expressed frustration at how the field has been developing, with Buckley, Doh and Benischke (2017) describing recent work in the field as “stale”, and Delios (2017) using the word “stultifying”. These are strong views. What these authors and others (e.g., Kolk, 2016; Van Assche, 2018) have in common is their belief that international business scholarship stands to benefit from more robust engagement with the pressing issues of a globalising society – holistically seen, and not only in terms of the private, for-profit concerns of various business actors. 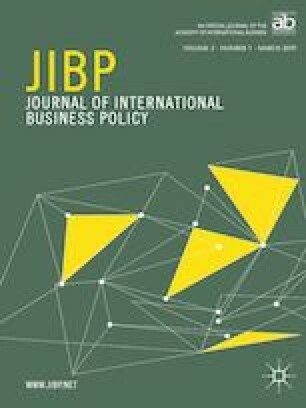 As a journal with a policy orientation, the Journal of International Business Policy (JIBP) is fundamentally interested in how international business connects with broader society. In a previous JIBP editorial, Van Assche (2018) suggests ways in which scholars can better theorize the social implications of international business activities. His focus is on how scholars can (re-)examine “traditional” international business topics such as firm performance, innovation and location choices through a policy lens. That is an important avenue for future work. Another way of invigorating international business scholarship is by looking at the international implications of (various types of) social engagement activities of (various types of) firms. A growing number of scholars have been considering how international business engages with issues of social relevance. The body of literature on Corporate Social Responsibility (CSR) in international business is growing, and focuses on benefits to both the multinational corporation (MNC) and society (e.g., Bondy & Starkey, 2014; Enderwick, 2018; Filatotchev & Stahl, 2015; Marano, Tashman & Kostova, 2017). There is also a growing body of work on MNCs’ sustainability initiatives (e.g., Burritt, Christ, Rammal & Schaltegger, 2018; Kaur & Sharma, 2018; Kourula, Pisani & Kolk, 2017), although most of that work is still published in journals focused on sustainability, rather than in international business publications. At first glance, these topics may appear tangential to the area of international business policy, since they focus neither on the promotion of firm internationalization nor on the attraction of foreign firms. In this editorial, I would like to argue against this overly narrow view of international business policy. In today’s globalizing world, many social concerns and activities involving the business community cross national borders. It has long been known that both “winners” and “losers” result from the changes brought about through globalization, e.g., job losses related to offshoring (Rodrik, 2018) and the globalization of innovation (Archibugi & Iammarino, 1999), but not many business scholars have seen these changes as fundamental to the field of international business. Having analyzed the origins of the current wave of populism, Rodrik (2018: 28) concludes: “The rules [to govern globalization] that need to be developed are those that emphasize fairness, address concerns of social dumping, and enhance policy space in both developed and developing nations”. None of his suggestions relate to a traditional understanding of international business. Instead, they suggest that social concerns need to be taken more seriously, and international business policy should play a central role in harnessing this. Similarly, Van Zanten and Van Tulder (2018) argue that surprisingly little has been done to analyze the role of MNCs in realizing – or not – the Sustainable Development Goals (SDGs). Social entrepreneurship – entrepreneurship with the aim of meeting social goals – is another topic that hitherto has been assumed to stand apart from the international business literature, and especially from international business policy. Being part of a national project on social entrepreneurship has helped me to understand how both international business scholarship and policy can be developed to more rigorously address social concerns. During this project, it became clear that social enterprises – even when they are micro in size – are more involved in the global system than previously thought. I was also struck by the mutual learning that resulted from the interactions between policymakers and academics, as the project offered a valuable opportunity to see how scholarship – and not just policy – benefits from academics engaging with policymakers. In this editorial, I reflect on these processes. Social entrepreneurship has been receiving scholarly attention for about 15 years now (Alvord, Brown & Letts, 2004; Seelos & Mair, 2005; Thompson, Alvy & Lees, 2000). Most of the scholarship and even case examples have come from industrialized economies, although there was from the outset awareness of the important role that social enterprises could play in less developed countries (Fowler, 2000). In South Africa, where I am based, executives and policymakers alike expressed the hope that social enterprises could help address post-Apartheid challenges, but more work was needed on the nature of South African social enterprises (Littlewood & Holt, 2018; Urban & Kujinga, 2017). In response, in 2016 and 2017 the Gordon Institute of Business Science (GIBS) of the University of Pretoria and the Graduate School of Business of the University of Cape Town, supported by funding from the government of Flanders and the SAB Foundation, conducted a large-scale baseline quantitative study of social enterprises in South Africa. A sample frame was constructed with the help of a broad range of (often non-academic) actors who had been working in the sector, and interview questions based on prior research were piloted. Then interviews were conducted with the founder or manager of each of 453 purposively selected social enterprises. It is well-established that social entrepreneurship reflects national dynamics (Defourny & Nyssens, 2010; Mendell, 2010) and in South Africa, where economic activity takes place within a well-developed formal as well as large informal sector (Ligthelm, 2006), it should perhaps not come as a surprise that the survey revealed essentially two forms of social enterprises, multinational social enterprises, and micro social enterprises. A few enterprises fell somewhere in the middle, but for both policy and scholarly purposes, it seemed wise to focus on the largest and the smallest forms of social enterprises. Ten percent of the social enterprises interviewed were sizable entities that operate across borders – half of them globally, and the other half in wider Africa. It has long been known that social entrepreneurship has a global dimension (Zahra, Rawhouser, Bhawe, Neubaum & Hayton, 2008), and the survey evidence from South Africa confirms that body of work. Consistent with prior evidence (Hoogendoorn, Pennings & Thurik, 2010), no clear organisational form was in evidence: the multinational social enterprises tended to rely on multiple legal forms and business models, including for-profits, franchises and trusts that they used to access various kinds of resources from within their home countries and globally. These multinational social enterprises are largely comparable to what had been described in other contexts. Knowing that the results resemble what has been done elsewhere allows both academics and policymakers to benefit from extant research. For example, international business scholars have previously argued that social entrepreneurship can be thought of as an extension to international entrepreneurship (Zahra, Newey & Li, 2014). From a policy perspective, the inappropriate adaptation of foreign models of social entrepreneurship (e.g., Cui & Kerlin, 2017; Park, Lee & Wilding, 2017) has been noted. It is therefore possible for South African scholars and policymakers to both benefit from and contribute to pre-existing conversations about these enterprises. But the vast majority of social enterprises in South Africa are extremely small, i.e. micro social enterprises. They are typically informal and operate purely locally – in a single “township” (historically black residential area) or suburb. They have a median of 53 beneficiaries and 8 employees, and 70% of social enterprises polled have a total annual income of less than R 300 000 (about US$ 25 000). In contrast, the budgets and numbers of beneficiaries of the multinational social enterprises were tens and sometimes hundreds of times greater than those of the micro social enterprises. 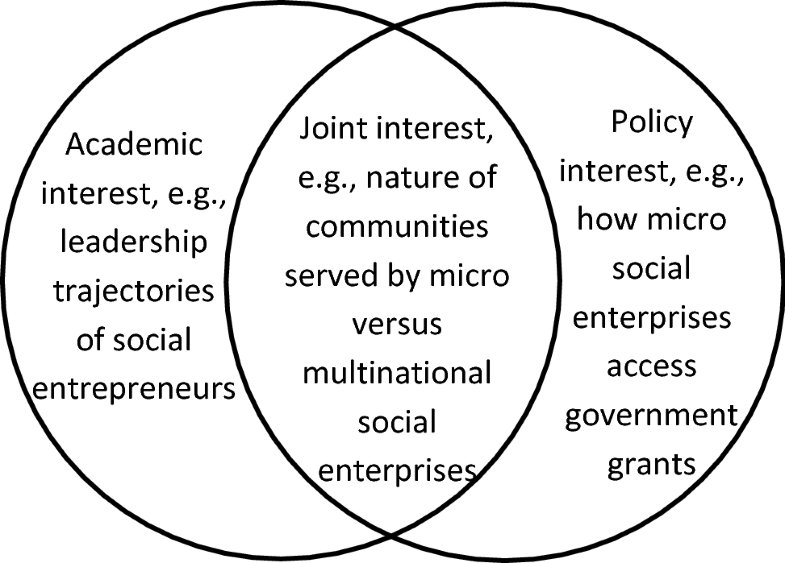 Such a “micro” social enterprise had been largely absent from scholarly view, and we spent considerable time making sense of their operations. Consistent with what was found in other contexts, government emerged as a key funder (Bacq, Hartog & Hoogendoorn, 2013; Shaw & Carter, 2007) but in more than a quarter of cases, government was not just a donor, but also an important trading partner – providing funds in exchange for services rendered. Social enterprises have sometimes been described as the “service provider arm of government” (Weerawardena & Mort, 2006: 27). There was initial concern that social enterprises delivering services on behalf of government could in fact be understood as a manifestation of government failure (e.g., Cook, Dodds & Mitchell, 2003). This could possibly be true of South Africa, where the government’s struggle to deliver services is well-known (Koma, 2010). But few would challenge the potentially beneficial role of social enterprises in the country, and recent work suggests that there is no need to conceptualize the relationship between social enterprises and government as a trade-off. Instead, the relationship between government and social enterprises is best understood as synergistic (Stephan, Uhlaner & Stride, 2015). But although the majority of micro social enterprises did engage in the sales of goods and services (especially to government) to increase the sustainability of their social mission, what emerged as the most important source of funding overall was not sales or even government funds, but CSR funds from established firms. Although the definition of CSR remains contested (Carroll, 1999; Bansal & Song, 2017), there is consensus that CSR involves delivering societal (not just financial) value to a range of stakeholders (not just those immediately associated with the firm). Corporate CSR and social enterprises are of course both concerned with creating more than simply financial value (Palakshappa & Grant, 2018), but CSR has not frequently been associated with social enterprises. Although this situation may be idiosyncratic to South Africa, the clear importance of corporate CSR funding for social enterprises has thought-provoking implications for both scholars and policymakers. It is possible that firms use CSR funds to support social enterprises because they are using social entrepreneurs as their “service provider arm” (again using the words of Weerawardena and Mort, 2006). In a similar way to how the government could be relying on social enterprises for the delivery of its services, it is plausible that firms could use social enterprises for the delivery of their CSR projects. This suggests the need to more critically examine the almost axiomatic assumption in the literature that firms would execute their own CSR projects (e.g., Bondy & Starkey, 2014; Filatotchev & Stahl, 2015), and to establish more precisely how firms connect with the communities they serve. In addition, it seems that investment into (the largely informal) micro social enterprises could be a pathway for formal firms – and especially MNCs – to connect with the informal sector in developing countries. 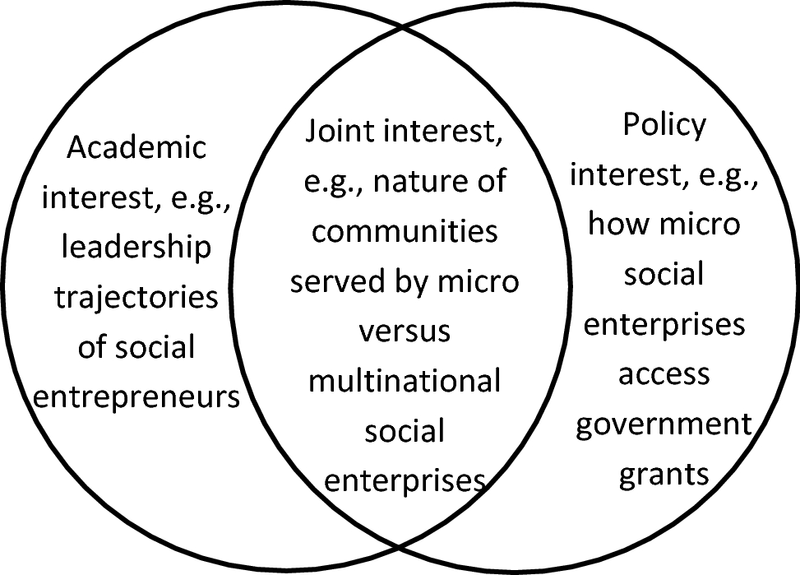 Although the micro social enterprises seem purely domestic, and their existence at first glance does not seem to have implications for international business, the evidence suggests that there are non-trivial connections. Although the survey did not require of enterprises to differentiate between the CSR funding from local versus foreign firms, it is known that especially in emerging markets, MNCs use CSR investments to support internationalization (Attig, Boubakri, El Ghoul & Guedhami, 2016; Yin & Jamali, 2016). Since MNCs tend to be larger and better resourced than local firms, and given that CSR is often a response to local rather than global issues (Husted & Allen, 2006; Park & Ghauri, 2015), it seems very likely that MNCs are involved in funding South African micro social enterprises. In their work on the role of international business in realizing the SDGs, Van Zanten and Van Tulder (2018) highlight not only the importance of developing partnerships between the private, public and civil society sectors, but also that these types of multi-stakeholder partnerships are relatively rare. The evidence from South Africa suggests one case in which such partnerships do exist. But much more work is needed to understand how such partnerships come into being. Almost all of the micro social enterprises operate informally – how do they connect with not only the formal economy, but multinational firms in particular? What is the decision process when MNCs decide whether or not to invest in these enterprises? For example, given the informality of these enterprises, it seems extremely hard to effectively monitor their activities. This raises the question of whether their activities and eventually performance are in any way shaped by MNCs. It is well-known that the formal economy can benefit from the “spillovers” from MNCs (Görg & Strobl, 2001; Meyer & Sinani, 2009) – is it possible to conceptualize an equivalent process in the informal sector? These are all questions that deserve further scrutiny. The academics who were involved in the report discussed these various forms of enterprises and how they related – or not – to what had been documented in other contexts. In trying to make sense of the differences between the micro and the multinational social enterprises, it was clear that extant literature could explain typically either one or the other form. For example, Alvord et al. (2004) had argued that successful social enterprises often had leaders who were from or at least had close contact with elite groups, and could scale beyond national borders. That seemed true of the multinational social enterprises but not of the small entities. But who were the leaders of those grassroots initiatives? We were also trying to make sense of the employment strategies of micro enterprises. A median of eight employees when the annual enterprise income was less than the equivalent of US$ 25 000 was very high. Some qualitative evidence had suggested that these micro social enterprises, operating in a country where the national unemployment rate was close to 30% – and in communities where it may well have been higher – saw the employment of people as part of their social mission. Saebi, Foss and Linder (2019) have commented that the competing objectives of social enterprises could result in role tension, and this case highlighted the importance of understanding how not only the social entrepreneurs but also their employees make sense of working in those enterprises. But while we were engaging with the results in one way, policymakers had a different focus. First, the policymakers expressed appreciation for the scholarly rigor that had gone into developing the report. They appreciated that the research was conducted by academics and not by consultants who could have been accused of having some kind of vested interest in the outcome. They were pleased by the rigor of the process: The thinking that had gone into the selection of the sample, and the way that questions built on what had been done by scholars in other contexts but adapted after a pilot study. For us, having standard scholarly practice acknowledged was a positive experience. At the same time, the perspective of policymakers raised questions that we had not previously considered. The very hybridity of the concept constituted a challenge to government, and while the survey was developed, they repeatedly challenged us to precisely define the concept – reminding us that precise definitions are not simply an academic exercise. Even while scholars theorize hybridity (Battilana & Lee, 2017), government officials pointed out that developing a supportive legal framework could be considerably assisted if social enterprises took a recognizable legal form. But even if one were to accept a variety of forms and the high prevalence of informal enterprises, the government representatives asked numerous questions about how government could best engage with social enterprises. What type of support was needed from economic development agencies, and what from agencies charged with the delivery of social services? Who should accept primary responsibility? It matters where social enterprises intersect with government – what are the goods and services that social enterprises sell to the government? How do these enterprises access government grants? Do they provide their beneficiaries with a targeted offering (e.g., either childcare or support to AIDS sufferers) or do they provide a range of services when engaging with a range of potential beneficiaries in their very local context? Of course, the scholars involved with the project could not really answer those questions. The questionnaire did not go into that level of detail – and it is not really the task of scholars to get answers to such questions. We were better able to engage in a meaningful conversation once we could draw on our respective strengths. It is perhaps useful to think of these various questions in terms of a Venn diagram (see Figure 1). Some of the questions are of interest to academics rather than policymakers. A question like the leadership characteristics and trajectories of South African micro social entrepreneurs is largely an academic question. It seems unlikely that they would resemble the leaders that Alvord et al. (2004) had described – for example, the entrepreneurs involved in micro social enterprises did not seem to be members of an elite. But they were nonetheless assuming consequential leadership roles in crafting organisations to serve their communities. Conceptualizing the relationship between academic and policy work. Similarly, many of the questions with which the government representatives peppered the academics – e.g., the nature and types of services that social entrepreneurs sell to the South African government, or how micro social enterprises access government grants – are essentially pure policy questions. Finding answers to those questions can help the government to better support social enterprises and in the process, better serve its citizens. But in many cases, there is a potentially productive overlap between the agendas of policymakers and academics. The probing questions of government officials into how social enterprises are defined forced far greater clarity than academic papers reviewing the multiplexity of the phenomenon. Of course, it is definitional that social enterprises have multiple goals, and part of the engagement with government was to explore how to provide support to enterprises that did not fit neatly into pre-existing categories. In those conversations, it was helpful to know that there are essentially two forms of social enterprises in South Africa – micro and multinational social enterprises. A large number of questions emerged in the course of making sense of this finding, and these questions are important international business policy questions. For example, evidence on CSR suggests that the societal engagement of MNCs is often intended as “global brand insurance” (Werther & Chandler, 2005) – in other words, it matters to MNCs how their work in the social domain is perceived. It seems likely that a similar process could govern MNCs’ investment in social enterprises, but it would play out differently in the two forms of enterprises. For a large multinational social enterprise, the risk of negative reporting may well be an important spur to ensure that operations were well-managed. But due to their small budgets and informality, monitoring the micro social enterprises would require a very different approach. It was also not clear whether the multinational social enterprises would have the same access to impoverished communities as individuals who live there. Do they serve different constituents? Better understanding the reach of these two forms of enterprises stands to enrich both academic and policy work. Finally, the literature on spillovers takes as its point of departure that the MNC is typically a bearer of superior technology and business practices (Meyer and Sinani, 2009). Are those assets of any use in endeavors with more general developmental intent, e.g., social enterprises? In other words, can MNCs help shape not only the business environment but also the social context in which they operate, and if so, what is the role of social enterprises in that process? Who is learning (what) from whom? The synergistic interaction between academics and policymakers is reminiscent of the “double helix” concept depicting the interaction between management- and policy-oriented research introduced by Lundan (2018). However, unlike in her conceptualization, in this case the core that is shared by policymakers and academic researchers is not theoretical; it is the challenge of a phenomenon. Precisely because academics and policymakers have different agendas, they can bring to bear fruitful differences in how they make sense of what they observe. The result is not only greater clarity, but also richness in work on the topic. When the mapping project of social enterprises in South Africa first started, we did not see connections with international business as a key consideration. We knew that some of the largest social enterprises operating in South Africa were part of multinational organizations. However, the focus of enterprises working in South Africa – because of the nature of the challenges they seek to address – has always been very local. However, the evidence suggested that social enterprises are cross-border phenomena in at least two ways. Multinational social enterprises play an important role, and support their activities with resources secured at least partially from outside (the relatively resource-scarce) South Africa. But even the informal micro social enterprises, through their reliance on CSR funding, had linkages with MNCs. In the policy domain, the actors remained largely local, although one of the funders, the government of Flanders, was international. But the local policymakers were mindful of the fact that policy in South Africa had not followed international experience, and they were keen to learn from experiences elsewhere. They valued the fact that the academics could connect the South African insights to what has been documented in other places. Much work stands to be done on social entrepreneurship in South Africa, not only by scholars and policymakers, but also by the lecturers and activists who translate findings into practice. But participating in the mapping of social enterprises in South Africa has clarified two points that are core to the mission of JIBP. First, it reminded me that in a globalized world, social issues are often global issues. International business scholars can contribute to important conversations by bringing to bear their training on issues that have hitherto fallen outside of the mainstream of international business research – and in the process, also help invigorate the field. Second, it was clear that scholarship can benefit as much from engaging with policymakers as policy can benefit from academic rigor. As JIBP continues to evolve, it is hoped that an awareness of social issues and a mutual respect for the contribution of policymakers increasingly characterize the journal. I would like to thank Kerrin Myres and Ari Van Assche for their input.